Brewing the perfect cup of Turkish coffee is exceptional in taste, body, aroma, preparation and presentation. Turkish coffee was invented by the Ottomans hundreds of years ago and remains one of the best coffees around to this day. Starbucks does not even come close to this extra-fine grind. The preparation I’m sharing today comes all the way from Turkey, from a dear friend who has walked me through the steps on how to make the perfect cup of coffee. Turkish coffee starts with a very fine grind. 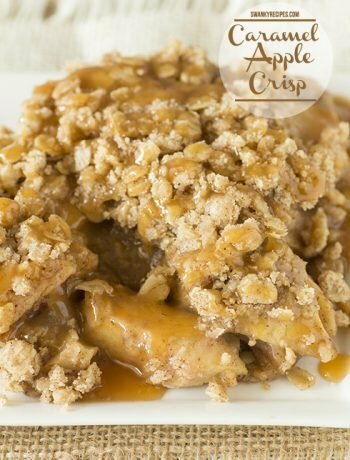 It’s ground as fine as confectioner’s sugar and makes for a very smooth body taste. The remaining powder settles at the bottom of the cup. Coffee enthusiasts all agree that that Turkish coffee is the way to go. Did you know that the the word ‘coffee’ is derived from the Turkish work ‘kahve’. Turkish coffee is a drink for real coffee enthusiasts and lovers. It’s for those who truly know and understand the flavor of the coffee itself. Long handled pots made from copper and brass create a surprisingly, satisfyingly thick coffee with natural sweetness. After you brew fragnant coffee, you’ll want to serve it in the traditional style? 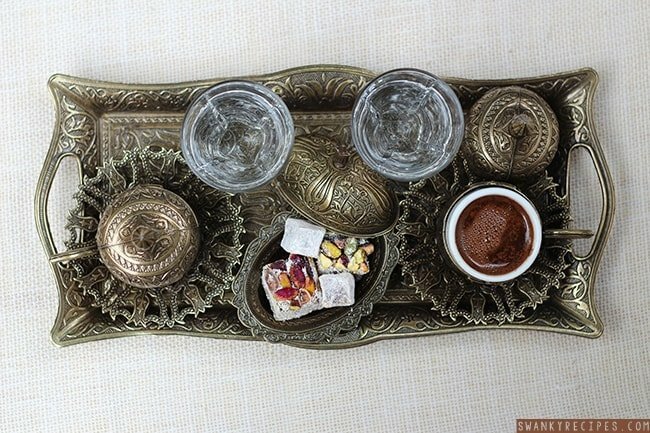 Most places around the world serve the coffee with tiny tea cups and in a silver tray with Turkish Delight. If you don’t have Turkish coffee and tea pot, You can get it from amazon. 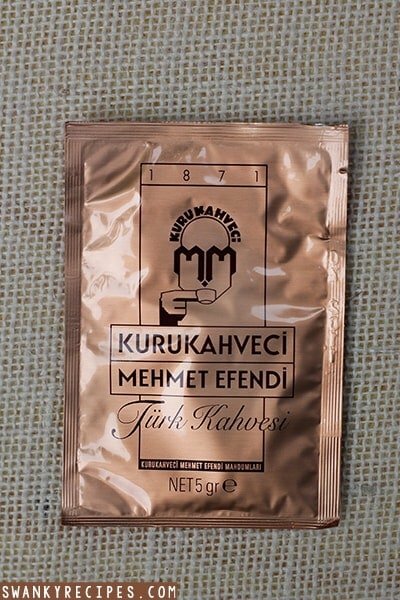 Mehmet Efendi Turkish Coffee 17.6 Oz. 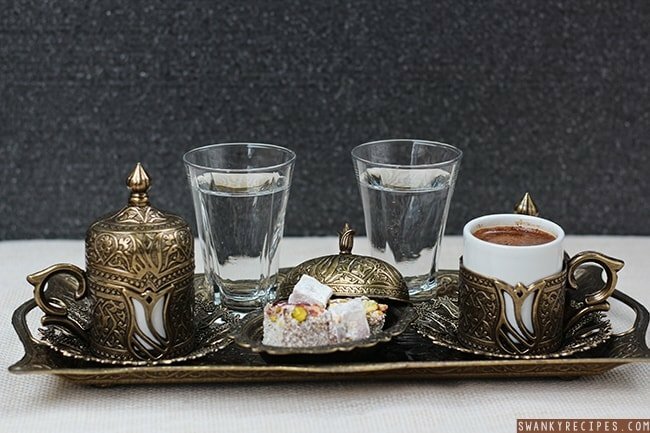 Turkish coffee is great for entertaining during the holidays. Not only will family and friends rave about the body of the coffee but the traditional Turkish coffeepot, coffee and tea set will impress coffee enthusiasts. I like to serve coffee during the holidays with dessert after dinner. Serving coffee in Turkey is the real symbol of abiding friendship. Coffee is a symbol of friendly exchange in Turkish culture. 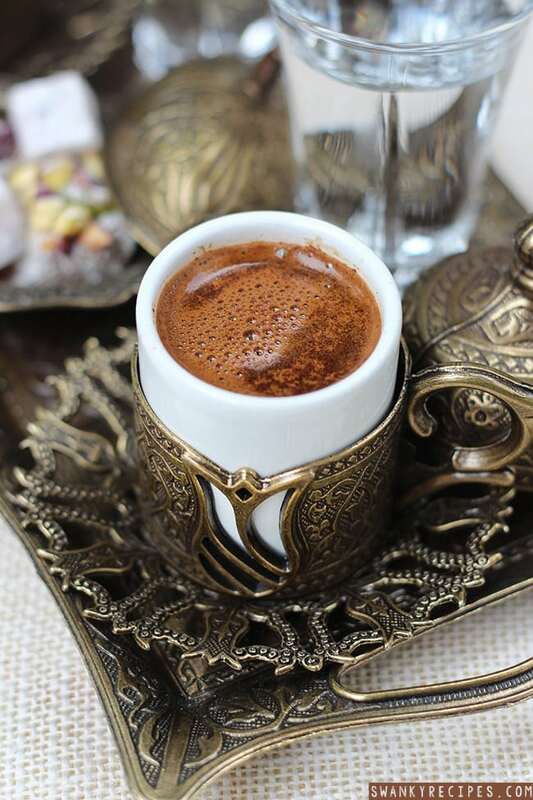 To prepare Turkish coffee, add water to the cezve (pot) with about 1.7 oz per cup of coffee desired. Add sugar to taste, stirring to blend, if desired. Bring to boil on stove top then remove from heat and add a teaspoon of coffee per cup. Boil coffee then remove the pot from the heat immediately after bringing to first boil. Discard foam and bring to boil again. Allow remaining powder to settle before serving. First of all, You should drink water to clean the palate. The water cleans your all tastes in your mouth. This helps to you get the delicious taste of coffee. After that, You can drink coffee slowly and savor it. 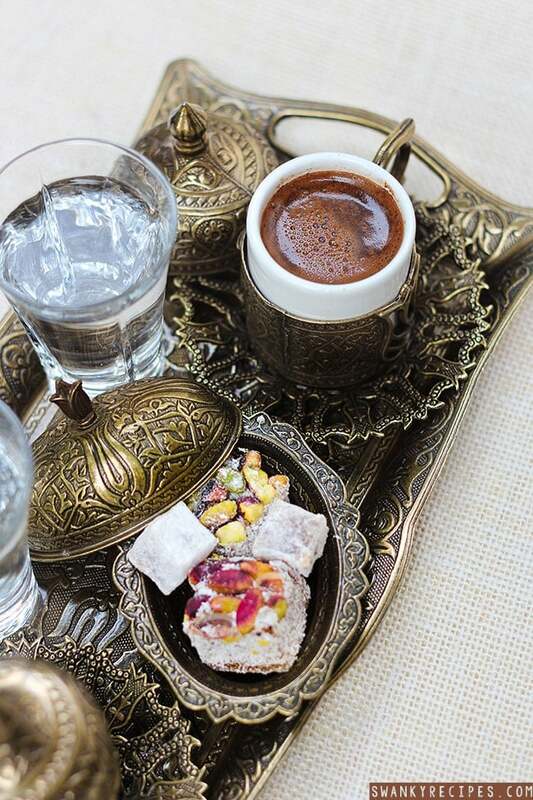 Turkish coffee has a pleasantly strong taste so after coffee, people eat Turkish delight for sweetness. I like to serve coffee with Turkish Delight or Turkish candy. My favorite is pistachio and I’ve had the pleasure of eating authentic Turkish delight. 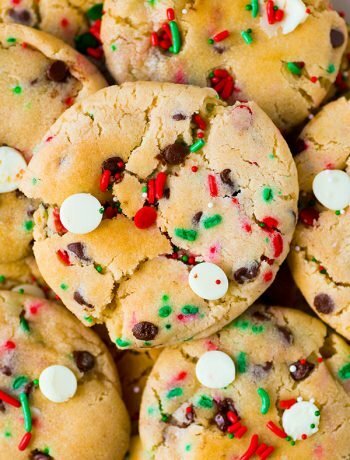 It comes in so many different flavors and they are all wonderful. It’s the perfect amount of sweetness to savor in the evening. Traditionally, the coffee is served in small porcelain cups resembling espresso cups. Did you know that the birth place of coffee is South Ethiopia. Ethiopia made dough from the seeds to use in food products. Years later, Yemen started to produce coffee. Although, Turkey doesn’t have any coffee trees in the country, it’s one of the most preferred ways to drink coffee in the world. That is enough for me to want to enjoy it for special occasions. 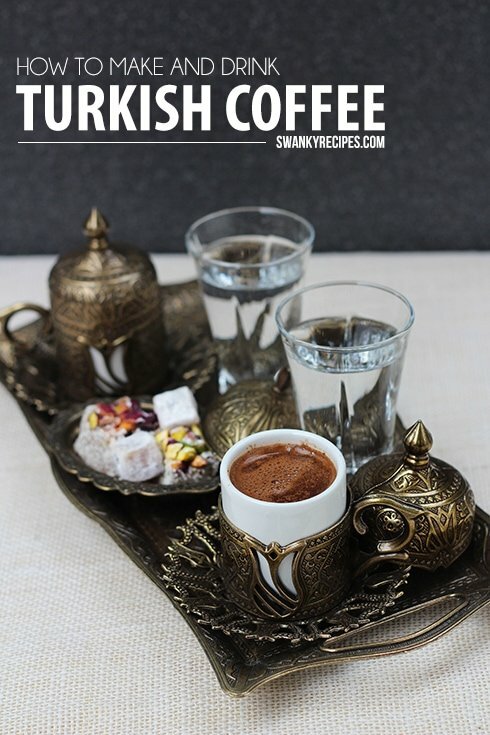 Turkish coffee is exceptional in taste, body, aroma, preparation and presentation. Finley ground coffee grounds make for the smoothest body and is a preferred way to enjoy coffee today. 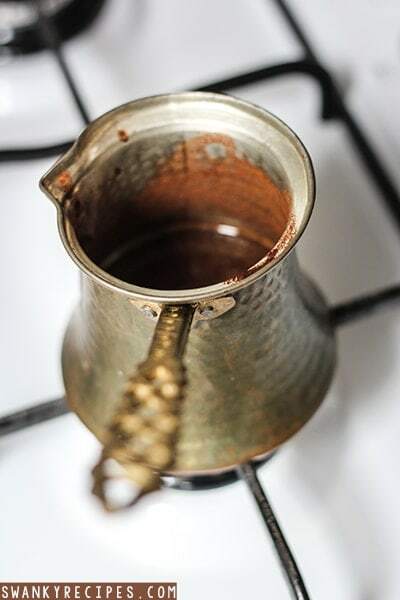 To prepare Turkish coffee, add water to the cezve (pot) with about 2 small turkish coffee cup. add 2 teaspoon Turkish Coffee. Add sugar to taste, stirring to blend, if desired. 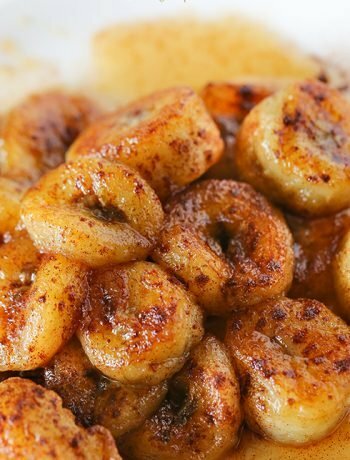 Bring to boil on stove top then remove from heat and add a teaspoon of coffee per cup. Boil coffee then remove the pot from the heat immediately after bringing to first boil. I’d love to get a machine someday, soon! Amazon actually carries this brand and it’s highly recommended from my Turkish friends. Here’s the link or simply just type Turkish coffee into amazon and it will pull it up, too! I’ve never had Turkish coffee but it looks tasty. The past few years I hadn’t been huge coffee drink up until my blog started taking more time which meant Sunday mornings making breakfast and coffee yum! I’m such a iced coffee drinker but I do make the exception with Turkish coffee because it’s just so different! Thanks, Donna! It’s a lot easier than it sounds. If I’m not drinking iced coffee, then this is the go to way to make it! I’ve never made Turkish Coffee before, but after seeing your lovely photos, I certainly want to try! It’s a lot easier than it sounds! Def must try it one day! What beautifully presented coffee. This would be great to serve up to guests. I am a huge coffee fan, love your serving tray by the way, thank you for all the tips, I need to enjoy some Turkish coffee soon! Thanks, Sara! Turkish coffee is amazing!